David Wallace-Wells led off his recent piece The Uninhabitable Earth in New York Magazine with "It is, I promise, worse than you think." To make the point, a trillion ton iceberg broke off Antarctica. And Turkey followed America's 'lead' by ankling the Paris Climate Accord. And the band played on. Think Progress responds to New York Mag's Uninhabitable Earth article that we aren't doomed by climate change but that "we are choosing to be doomed." 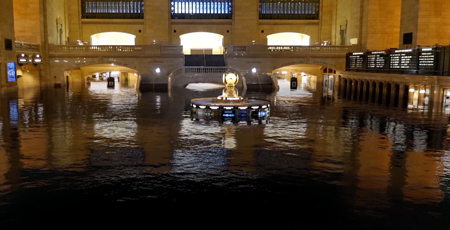 The short video Two °C shows how a flooded New York City would look as a result of a two-degree rise (3.6 Fahrenheit) in global temperature. It's stomach-turning because it seems so little like science fiction. The Naval Cemetery Landscape at the Brooklyn Navy Yard opened a year ago, designed by Nelson Byrd Woltz Landscape Architect and Marvel Architects, part of the Brooklyn Greenway Initiative. With all the dispiriting environmental news, we just wanted to tip our hat to this reclaimed 1.7-acre space—a meadow overlaid with a boardwalk. The site of a burial ground, the space rightly invites contemplation over playing Frisbee, making it a sensitive and attractive addition to the city. Among their many sins, McMansions are the brick and mortar version of gas guzzlers, as detailed here. The blog McMansion Hell has been skewering these blights until Zillow threatened to sue (McMansion Hell was marking up listing photos for their satire). With some pressure from the Electronic Frontier Foundation, Zillow has decided not to pursue the matter.